Mention Japan to the average person on the street and it will not take long for someone to make a reference to the Samurai, or their “arch-nemesis,” the Ninja. Even now, a century and a half since Japan was opened up to the rest of the world, the image of the Samurai, those mythical and super human of ancient warriors, still serve as a symbol that popularly defines Japan. 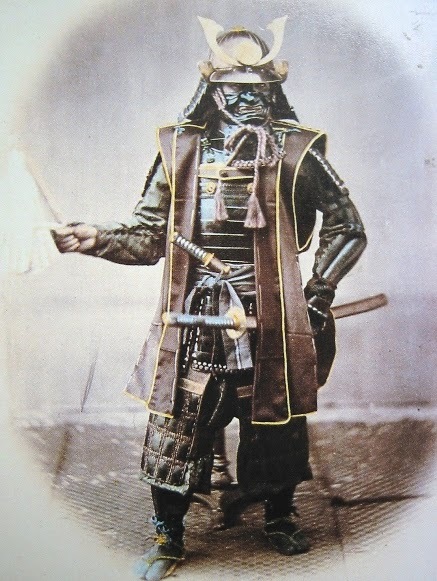 While we can contemplate the many possible reason why Samurai are still so popular more than a century since the end of the shogunate, I think it is more important to ask what exactly defines a Samurai? Given their great importance as a national symbol of Japan, I have to think that the popularity of the Samurai is due to more than their unique armor, arms, and feats of combat. A Samurai warrior in feudal Japan was more than his raiments, more than a mere weapon, crafted by masters and wielded with precision honed by decades of training, and far more than a socio-economic class. I think that the true importance of the Samurai lies not so much in their deeds, but in what we want to perceive those deeds to be. It is this “ideal” or “idea” of Samurai, the one who serves, the ultimate warrior, who will face any odds and do what it takes to protect whatever it is they have sworn to protect, that we have fallen in love with, and all the myths and misconceptions that come along with it. This concept of the “ideal” Samurai is directly related to the infamous Code of Bushido, known more popularly as “the way of the warrior.” But the reality of Bushido is almost as vague and confusing as the true history of the Samurai. What’s important to note again is the idea or “ideal” of Bushido is what carries the most weight in historical context. While the written accounts of Bushido, and the teachings that it encompasses, are relatively recent in comparison to the entirety of Japanese history, much of what was recorded is often framed to be the accurate and factual basic concepts behind the totality of Samurai history and practice. The pure essence of Bushido are its seven core principles, values that Samurai should strive to not only apply to their lives, but also outwardly express so all could tell by observing their actions that they were living up to the expectations and duties entrusted to them. If you really wanted to be a Samurai (and therefore the “ideal” and “iconic” model of a Japanese citizen) then you should always display the following virtues in your life: benevolence (jin), bravery (yuu), loyalty (chuugi), politeness (rei), honor (meiyo), veracity (makoto), and justice (gi). While these seven virtues are not uniquely Japanese, when viewed collectively they are the core of Bushido, which is a very “Japanese” concept. To follow the ways of Bushido, to learn how to apply these virtues to your life and live by them on a daily basis, is popularly construed as to walk the same path as the Samurai of old and become in a sense the Japanese “ideal” yourself. So how does Yoshika Miyafuji, the protagonist of Strike Witches, fit into all of this? When you look at the entirety of he first season, what you discover is a coming of age story. You will see Miyafuji mature from her role as a typical high school student living in the Fuso Empire (or as I like to call her, a loli version of Shinji Ikari) to that of a Neuroi-fighting super-soldier. During this transformation, Miyafuji learns new things about herself, begins to exhibit personality traits that until then have been repressed, and watch as these become defining parts of her character. 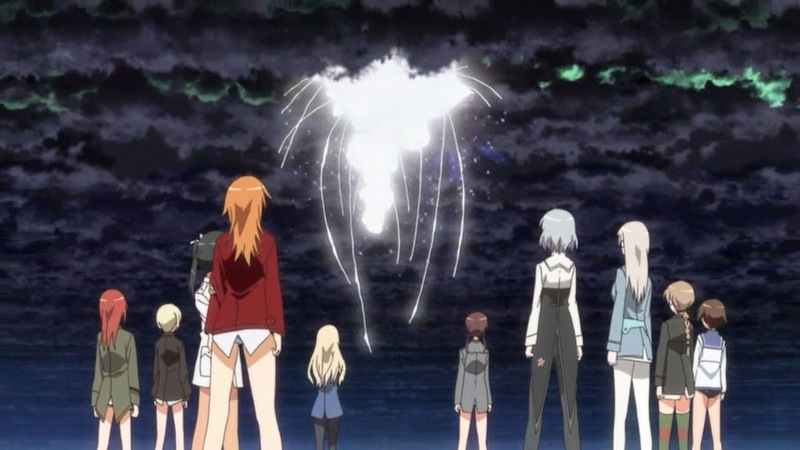 These traits develop gradually during season one of Strike Witches, and at least outwardly appear to be the same seven core values that make up the Japanese Code of Bushido. Therefore, this process that Miyafuji undergoes, or the journey rather that she takes, is one that I [affectionately] call “Moe Moe Bushido.” Let’s take a closer look now how this plays out. Benevolence: using one’s own strength to support others, and perhaps most importantly, being proactive- taking action to make sure you are in fact at the right place at the right time. Our first introduction to Miyafuji is a wonderful example of this aspect: when a little black kitten is stuck up in a tree, it is Miyafuji alone who climbs up in an attempt to save it, while everyone else in her class is still on the ground, wondering what the resolution will be. 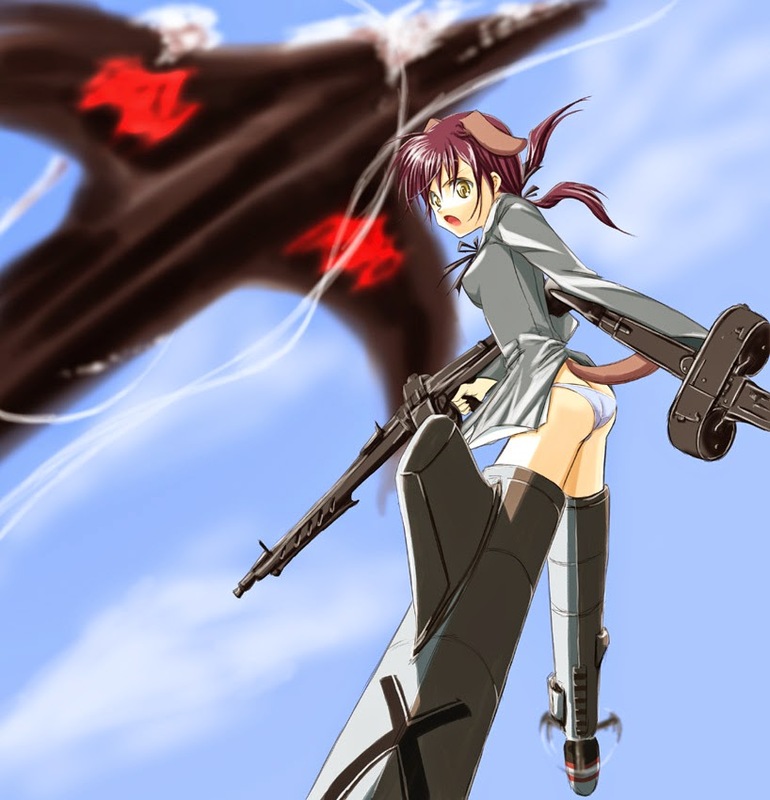 Later, during the battle against the Neuroi in episode three, Miyafuji literally uses her own strength to support Lynette Bishop in her time of need (flying under Lynette and her sit on her shoulders), before following Lynette’s instructions for attacking the Neuroi in unison, therefore assuring its destruction. Bravery: bravery and courage are not the act of not be afraid, but rather of being afraid, and doing what one had to do anyway. A less fancy way to say this is “talk is cheap, action is everything.” At the start of Strike Witches, Miyafuji is a diehard pacifist who makes it clear she has no intention of fighting against anyone. However, she will still support those who do, and assist in any non-combat role she can perform. In time Miyafuji learns that with great magical power comes powerful abilities that need to be used. While en route to Britannia, Miyafuji watches Major Sakamoto and the other soldiers of the Fuso Empire fight off a Neuroi attack. While she is willing to do what she can to help the injured, Miyafuji quickly learns that because she is unwilling to fight there is nothing she can do to prevent and stop the carnage around her. Only by taking an active role, and being willing to pass a fist through a Neuroi while holding a sword can Miyafuji truly be able to change anything. Loyalty: taking responsibility for what has been entrusted to you and standing fast with your allies as they stand fast with you. Most of Strike Witches can be read as an example of loyalty, showing how the members of the 501st depend on each other to get the job done. But my favorite example regarding Miyafuji has to come from episode four, because it is hear that we first see a major shift in her personality. In this episode’s battle, we see Barkhorn enter berserker mode, trying to either take out the Neuroi solo or die in the process. Barkhorn has by now become consumed with guilt stemming from her inability to protect her younger sister, that she surrendered the will to go on fighting. Seeing Barkhorn seriously injured, Miyafuji races to try and heal her, with a total disregard for her own safety. Even though the healing process will leave herself drained of magical power for the time being, placing herself in great peril as well, Miyafuji will not leave her fallen comrade. She is aware that the sacrifice she is making is one well worth it, since a semi-healed Barkhorn has a better chance of victory than Miyafuji at her peak. What makes this scene the best example of loyalty is that while Miyafuji is trying to heal Barkhorn, the stubborn soldier from Karlsland is imploring her to stop. In a very un-Japanese moment Miyafuji, the junior, LECTURES Barkhorn, THE SENIOR RANKING OFFICER, about being selfish. Here we see Miyafuji give Barkhorn a lesson and quick pep talk about loyalty, and this tiny bit of motivation is all Barkhorn needs to pick up her MG-42s and get back in the fight. Politeness/ Respect: there is no honor in force for the sake of force, and the way you treat others, be they friend or foe, is just as important as your physical strength. I really cannot think of a more Japanese concept than this. Regardless of situation, there is ALWAYS an acceptable and expected way to do things. In Strike Witches, the best example regarding Miyafuji honing her skills at being polite and showing people respect is in her dealings with Perrine Clostermann. Perrine is relentless in her constant taunting and reprimanding of Miyafuji for every little thing she does, and on many occasions such input is not required or requested. That Miyafuji can keep her cool on those instances speaks volumes to her character, one that has already been previously noted as being capable of challenging authority when the situation calls for it. Honor: as Master Yoda would say “judged by your actions you are, reflect the true nature of your heart they do.” Again, a variation of “talk is cheap, so put up or shut up.” Time and again in Strike Witches, we see Miyafuji hard at work performing a variety of duties. Occasionally she might gripe, or pass out from exhaustion at the end of training, but every time she is given a task, Miyafuji does it. Honor is not about always having a smile on your face, skipping through the land of sunshine and lollipops. Honor is setting your own wants and desires aside, because duty requires that we all have to roll up our sleeves and do what has to be done, whether we want to or not. Our attitude about the task is irrelevant, all that matters is that we do it. Justice: you do not seek out justice, you deliver it. This is an odd, and tricky concept to deal with, but works wonderfully in Strike Witches. Fighting back against the Neuroi is not only acceptable, but encouraged. Blast them into tiny little sparkly pieces, but make sure to only destroy the Neuroi that are acting aggressively towards you. Near the end of the first season, Witch-like Neuroi appear that do not attack or act in an offensive way. These Neuroi seems to play nice, only looking to make friends. So who does it seek out and try to communicate with? Yoshika Miyafuji! Why? Because only Yoshika Miyafuji can understand the concept of Justice in relation to the code of Bushido. Only Miyafuji can sense the intentions of this Neuroi, knowing that it is not acting hostile, and has no ill intentions, only that it has only come in an effort to communicate. So only Miyafuji is able to act in a just manner, and show the same respect and just action in return. Because of this, only Miyafuji is able to enter the core of the Neuroi hive to learn the final value of Bushido . . .
Veracity/ Truthfulness: you always seek the truth, you always speak the truth, your word is your contract. It is here with the search for the truth that Yoshika Miyafuji’s journey both begins and ends. When she first joins the military and agrees to travel with Major Sakamoto, Yoshika’s entire purpose is to learn more about her father’s work and what happened to him (to discover one’s past perhaps?). Now, having learned all she can about her past, Yoshika Miyafuji stands alone in the center of a Neuroi hive, facing both its core and her destiny. 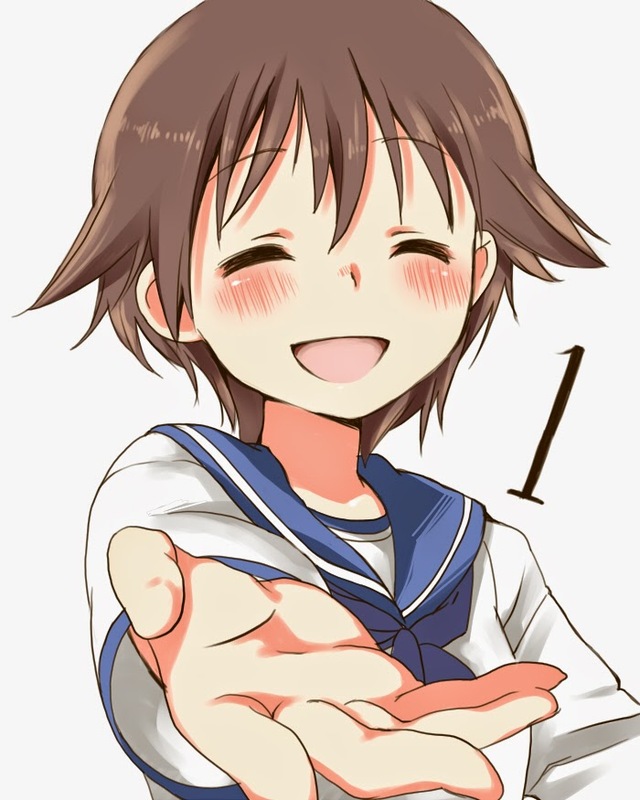 Seeking nothing but the truth, desiring nothing more than to know what message the Neuroi wished to give her, Miyafuji reaches out her hand and makes physical contact with her former enemy. In that moment she learns everything- every bit of knowledge the Neuroi possess has been passed on to Yoshika. Where they came from. Their intentions. The history of the Human-Neuroi wars. While she does not yet know what all this information is, nor what it means, she now has all that she needs to go forth and fulfill her destiny. Because Miyafuji was willing, able, and successful in her pursuit of the truth, she was able to set things in motion and detect the treason in the Britannia military, unleashing the rouge military faction and their creation the Warlock. In the final climatic battle between the 501st and the Warlock, it is team work that triumphs and takes out the giant flying aircraft carrier. But before that there is one witch who races off into battle ahead of the others, facing off against the Warlock in single combat. By this point in the series, Miyafuji is no longer the semi-competent school girl who can barely fly and is afraid to fight. After undergoing her transformation, after walking this path of Moe Moe Bushido, Miyafuji is now one of the best warriors in the 501st and their best chance at victory. Haru Menna is a great lover of Japanese popular culture and military history. In addition to devouring shows with cute girls in them, he also has been known to present panels on WWII in Anime, Yandere Culture, and Japan's Fear of Technology at cons.